AZUSA, CA--(Marketwired - Jun 19, 2015) - Christopher Homes is currently offering a limited number of move-in ready, new luxury homes at Azalea in the award-winning master-planned community Rosedale in the San Gabriel Valley. Among the quick move-ins available is a spectacular Residence One with approximately 3,174 square feet, four bedrooms, a versatile bonus room and an oversized two-car garage. Boasting impressive Spanish style architecture, this two-story home features an open living concept and dining areas with a stunning California Room for indoor/outdoor entertaining, rich cocoa stained shaker cabinets, a desirable Kitchen Aid stainless steel appliance package and designer selected flooring throughout. Another exceptional opportunity is a beautiful Residence Two spanning approximately 3,414 square feet with four bedrooms, a spacious bonus room, home office, California Room and an oversized two-car garage. This single-family home is adorned with an array of designer selected upgrades including maple painted cabinets in vivace white, an upgraded Kitchen Aid Pro stainless steel appliance package, specialty electrical, home theatre pre-wire and more. To learn more about the quick move-in opportunities available at Azalea, buyers are encouraged to visit the sales gallery and register their interest online at www.LiveAzalea.com to stay informed with the community's latest updates. "Azalea's quick move-ins not only present the ideal opportunity for luxury living in a desirable Azusa setting but also offer the added value of beautifully upgraded interiors," said Jaime Todd, Director of Sales and Marketing for Christopher Homes. "With a limited number of upgraded homes that are move-in ready, buyers are encouraged to visit the sales gallery before these opportunities are gone." Azalea features three luxurious single-family residences that offer approximately 3,174 to 3,538 square feet of living space with four bedrooms, up to five and one-half baths and two-car attached garages with storage and/or workshop space. Highlights of these expansive home designs include impressive great rooms, versatile bonus rooms, convenient downstairs bedrooms in all floorplans, gourmet kitchens with large center islands and desirable customization opportunities such as the optional California Room to expand living and entertaining space outdoors. A home office is featured in the Residence Two along with private master suites on both the first and second floors. The neighborhood's largest design, the Residence Three has a spacious master retreat with his and her dual baths and a versatile guest suite on the first-floor. Finely detailed architectural themes showcasing Spanish, Monterey and Cottage influences complement the collection's impressive interiors. These new homes are priced from the $800,000s. Beautifully situated in the foothills of the San Gabriel Mountains, amidst 518 sprawling acres, including 290 acres set aside for open space, the master-planned community of Rosedale features an array of resort-inspired recreational amenities for residents to enjoy. These include The Resort, a 4,500 square-foot private clubhouse and two-acre recreation center, with a state-of-the-art fitness center, Junior Olympic swimming pool, open-turf play area with Adventure play structure, turf volleyball and more. In addition, the community has ten one-of-a-kind neighborhood parks for picnics, games and gatherings with friends and neighbors as well as miles of scenic trails for walking, hiking and biking nearby. Situated near the I-10 and 210 Corridor, Rosedale is a tranquil retreat that is easily accessible to urban Los Angeles. The future Metro Gold Line boarding station, slated to open in early 2016, will also provide another transportation option and will be within walking distance for residents of Rosedale. For more information, visit www.foothillextension.org. Inspired by the past with its focus on the future, Rosedale is the newest and finest master-planned community for brand new home living in the San Gabriel Valley. For more details, please visit www.LiveRosedale.com. Christopher Development Group and Christopher Homes are privately held companies with offices in Newport Beach, California. Christopher Homes is known for residential building excellence. 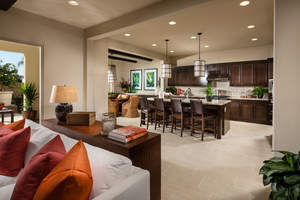 They have a 40-year history of building new homes and master-planned communities throughout Southern California. Founder, President and CEO Christopher Gibbs is directly responsible for building more than 15,000 new homes in communities including the Huntington SeaCliff planned communities in Huntington Beach, Westridge in La Habra and Rosedale in the San Gabriel Valley. To visit Azalea at Rosedale's models and sales office from Pasadena, travel the I-210 east and from San Bernardino and Riverside counties, take the I-210 west. Exit Azusa Avenue and head north into the foothills. Turn right on Sierra Madre Avenue, then turn right again on Vosburg Drive. Continue past Gardenia Drive until you reach the sales office at 572 East Vosburg Drive. Azalea is open Monday from 1 p.m. to 6 p.m. and Tuesday to Sunday from 10 a.m. to 6 p.m. For more information, call 626-804-7600. Those interested are encouraged to follow Christopher Homes on Facebook and Instagram. Visit www.christopher-homes.com for more information. Prices are effective as of the date of publication. Azalea offers three distinctive single-family residences that range from approximately 3,174 to 3,538 square feet with four bedrooms, up to five and one-half baths and two-car attached garages with storage and/or workshop space.